I was ironing my clothes when I had the fun of memorizing the first six verses of Psalm 27. I couldn’t help but go back at verse 4 over and over again, as this has become the favorite of many of us who are in love with Jesus. Here’s one thing I realized while meditating on this verse. While this cry from the psalmist’s heart has become our heartfelt prayer, too, the Lord has already answered it through His Word, too. 1 Corinthians 3:16 reminds us, “Don’t you know that you yourselves are God’s temple and that God’s Spirit lives in you?” God’s has given His promise of the Holy Spirit’s indwelling to those who have given their lives to Christ. As we stand as the temple of His Spirit, we have access to His glory and His beauty which we can gaze all the rest of our lives. We don’t have to look for His presence from some distant place as He Himself is already living within our hearts. I have been praying Psalm 27:4 but was surprised to know that God has already answered it. But this doesn’t mean I have to disregard it. Instead, I have to ask for an increase of awareness and of desire to walk with His closely, I can hear the sweet rhythm of His heartbeat. Sunshine creeps into my room. Little birds called maya perch by my window to awaken me with their mischievous but sweet chirping. I breathe in the morning air despite having a stuffed nose, a daily sign of having allergic rhinitis. Still, I sit up, meditate, and pray. When I open my Bible, revelation overflows, an encounter with God occurs. This is the One Thing I want to live up for. This is the One Thing I cannot trade with anything else with the world. In this season of waiting, I am restored back to His presence and His intimacy. Like the psalmist in Psalm 27, I learned to pray: “One thing I ask of the Lord, this is what I seek: that I may dwell in the house of the Lord all the days of my life, to gaze upon the beauty of the Lord and to seek Him in His temple.” (verse 4). I’ve lost this when I was working. I’ve been focused too much on the thrill of being a part of daily news events that I’ve lost focus on the God who is sovereign over these events. I forgot that there is more worth in His presence than being among congressmen and senators. I struggled with my daily prayer walk with God. I tried to seek him but ended up exhausted and stressed. But deep in my soul, I am thirsty; thirsty for the Living Waters that can refresh me. Most of all, I was hungry for an intimate fellowship with the Lord. The experience of encountering God was all I desire. To hear, see, and know Him was all I could ask for. After the moment I resigned from my job, my empty cup was filled to the brim. Day and night, I sought for His presence. For the first time after all these years, I stayed locked in my secret place to wait upon the Lord for hours. I never thought I could experience what I used to envy the routine great men of God were able to do. All that four years of prestige, ambition, and achievement can never make up for that moment of staying in God’s presence. I felt that every reward this world has given me was nothing compared to the sweetness of intimacy with the Lord. Oh, I my dwell in the house of the Lord all the days of my life. But in all these, this waiting moment is my time to pray for the coming days. Oh, that God would guard my heart on the moment I return to the competitive world. Let me not make the same mistake of worrying as I wait for a new job. Let me keep on pushing in prayer, trusting in the Lord after I have done my part to apply for a new job. But, I pray that this fellowship would not stop the moment I go back to work. May it flourish not only in my life but in the life of many as well. The blanket of darkness now hovers over my little village. Silence cloaks the dusty roads that were once invaded by the sound of playing children and roving motorcycles in the morning. 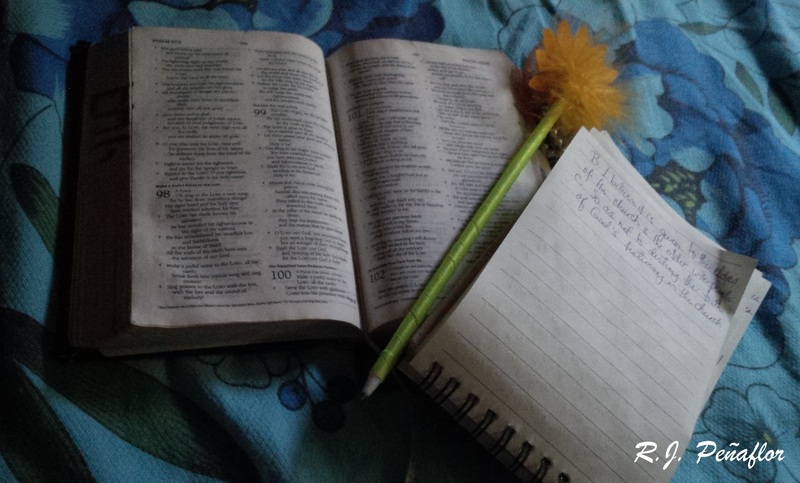 Once again I am alone in my room, having nothing but my pen and notebook, my Bible, and myself. Come again the silence. Come again the longing heart. And upon my waiting, I hear His voice once again, breaking me into tears, tendering my heart to heart His heartbeat once more. This is the One Thing I am to live for. This is the One Thing that can never be compared to any other prestige in this world. “How do you know you’re in love?” I asked an officemate while walking home. I only smiled. To be in love must be a crucial thing. I’m happy for my friends who get into relationships. But there are times I’m tempted to be jealous. I used to hate to see lovers walking hand in hand in malls because they looked so corny. But now, I hated it because I’d secretly wish I’m like them, too. For those who do not know, I never had a boyfriend since birth. I’ve had crushes, of course. But the feeling of infatuation can be confused with love. I get attracted, but to handle one’s heart is another thing. A lot of boys (and even men) would express how pretty I am, but are not really that serious. Because nobody had ever expressed (yet!) how serious one can be, I’d sometimes wonder what’s wrong with me. Such is the longing to be loved. Perhaps, it would be heavenly to know that someone is excited to see me at the end of the day and share how he feels for me and holds my heart gently at the same time. Deep inside of me, I swear that I will love this person with all my heart and take care of his heart, too. Let me be a woman that he will honor, the flesh of his flesh and the bone of his bones. May he become my strong right hand, my knight in shining armor who would not turn back when the dragon’s fire strike. His desire be only be for me and my love be only be his. I wonder…just wonder…how will this love change me as it would change him, too. I’m so excited, but when I find I’m not yet at this stage, I feel desperate. Perhaps, just perhaps, he has not found me yet. And I might not have heard of him yet. Perhaps, he’s praying the same prayer as I do. And we’re just on the way to the intersection. Perhaps, our hearts have not been unveiled before one another. As my friend puts it, “You will never expect when to fall in love.” It’s amazing when lovers cherish their love, but what’s more amazing is how they cherish each other. These people waited (though they are younger than me), prayed, and sought for God’s heart and their beloved’s heart. They did not go for the sake of passion but pursued at God’s go signal. They can balance their life’s aspect while handling a relationship. They know which one is worth and not. They may be different from their boyfriends or girlfriends and yet accept each other no matter how different they are. This I saw it from my friends, and perhaps their season has come for me to see how the Lord blesses such relationships borne in purity and true love. The dream of your heart? Or must you stay in seclusion?